Greenpeace and the Norwegian organisation "Nature and Youth" have recently sued the government of Norway to prevent the exploration of new oil fields in the Barents Sea. With it, climate activists are following a new path: rather than persuading the government to implement better policies, they want to enforce such policies through a court of law. This new direction from nature organisations follows decades of activism to convince governments and the public that they should take climate change seriously. I have participated myself a few times and demonstrated outside of the buildings where UN climate negotiations were held, but unfortunately back then George W. Bush had just been elected USA’s president. Other times, politicians did seem to listen, such as last year in Paris. Slowly and steadily, after a great amount of pressure, politicians realised the seriousness of the climate problem. But despite this realisation and many good intentions, the Norwegian government is still not making the required, sometimes difficult, choices. Nonetheless, a trial is is a big step. Why so impatient? Isn't Norway already participating in all the climate treaties? And isn't there a lot of good news lately? Yes, the Paris agreement will go into effect next Friday now that it has been ratified by a sufficient number of nations, including Norway. Also, almost 200 countries agreed to limit the emissions of the powerful greenhouse gas HFC, which is used in air conditioners and refrigerators. And if that weren't enough, the airplane industry came with an agreement to limit CO2 emissions. But when we take a close look at these treaties, it becomes clear that nice-sounding agreements are worthless if they're not followed-up by effective policies. The agreement by the airplane industry, for example, has a lot of drawbacks and will primarily compensate CO2 emissions with environmentally friendly projects. Rather windmills in India than reducing CO2 emissions from airplanes in a meaningful way. The agreement on HFC's is a great step, but will mostly prevent future warming. These greenhouse gases contribute little to the current warming of the planet. It is an honourable aspiration of the Paris agreement to limit global warming to somewhere in between 1.5 and two degrees Celsius. But the agreement is not legally binding and countries are free to decide on how they will reduce emissions. In this way, even the upper limit of two degrees becomes incredibly difficult to achieve. To have a reasonable chance of staying below it we can only emit an additional 600 to 1200 billion tons of CO2. If we don't lower our emissions right now, we will have reached that limit in 15 to 30 years. Besides, the world’s proven oil, gas and coal reserves are much greater than the remaining emissions budget. A majority of these known reserves, therefore, need to stay in the ground. That's precisely the reason why it's so absurd that the Norwegian government is allowing for the exploration of new oil fields, since there is no wiggle room to still burn that oil. Seen that way, it is entirely understandable that organisations such as Greenpeace and Nature and Youth will do anything to prevent this from happening, even if this means going to court. 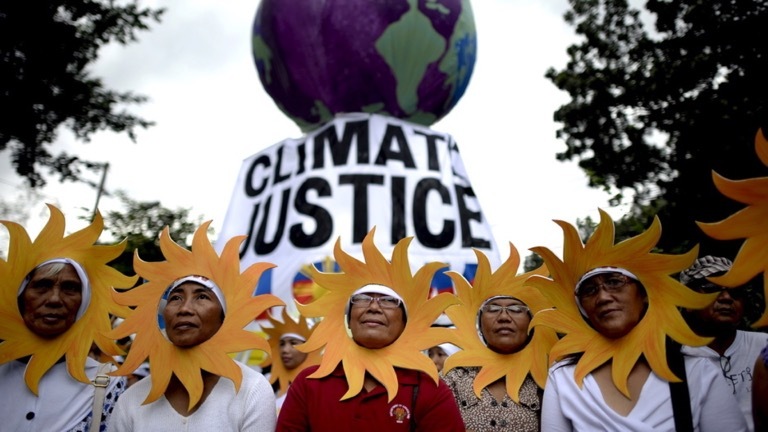 Climate activists have opposed governments for decades, as seen here at a demonstration in Manilla. Going to court is their last resort. A similar climate trial started three years ago in the Netherlands. About 900 concerned citizens united in the organisation "Urgenda" and pleaded in front of the judge that the Dutch government was jointly responsible for causing worldwide and dangerous climate change by not sufficiently reducing CO2 emissions. In April of last year, the judge ruled in their favour, and ordered that the Netherlands should reduce their emissions by 25% in 2020. A historical first, since never before did a court of law correct the climate policies of a nation. And this happened in the home country to the influential oil company Shell. So that sounds promising for the Norwegian climate trial, but it won't be easy since it also deals with a complex judicial dilemma - which also became apparent from the various opinions of legal experts on this case. Can a court of law force the Norwegian government to change their policies? Doesn't this go against the principal of the separation of powers? Of course the same issue was also raised in the Dutch case, and the government tried their utmost best to have the lawsuit dismissed on these grounds. Fortunately, the judge did not agree with them. While ruling his verdict, he phrased it as follows: "It is a fundamental aspect of the constitutional state that also the actions of political bodies, such as the government and representative assemblies, can – and sometimes has to – be judged by a from these bodies independent court of law."